Seen from above, a Hearts and Arrows diamond shows an arrow pattern. 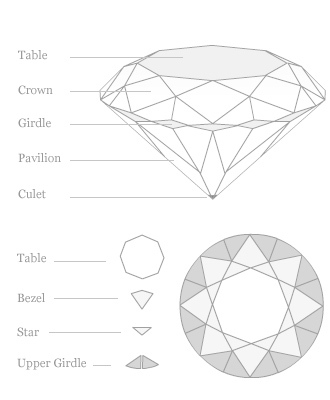 When displayed on its pavilion side, the diamond presents the eye with 8 hearts with tiny 'v' shapes. Genuine Hearts and Arrows have these patterns visible at a single glance, indicating that the diamond has perfect optical symmetry. Our Hearts and Arrows collection are the ultimate expression of love - that's why we call them TrueHeartsTM. Every diamond from our TrueHeartsTM collection is a lasting masterpiece, a perfect diamond. Hearts and Arrows diamonds are sold under many names - Hearts on Fire and Leo Diamonds are two popular examples. At James Allen, we take pride in presenting only the finest Hearts and Arrows diamonds money can buy - every single TrueHeartsTM diamond we sell is cut and polished at 100X magnification. Furthermore, our exclusive Diamond Display TechnologyTM lets you see any True HeartsTM diamond magnified in 360° so you can see exactly what you are getting.